An open source plugin to automatically retrieve lyrics from VocaDB and other sites based on the same code. Still in beta, but should work well enough. Like with any plugin, extract the .dll into your plugins directory and enable it in the settings. You can change the priorities of different lyrics sources in the 'Tags (2)' tab. 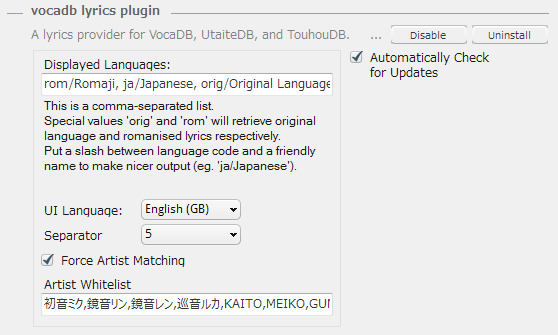 Currently there is no complete documentation, but key things you might want to change are 'Displayed Lyrics' (what types of lyrics from the db are shown), 'Force Artist Matching' option (controls whether song artists not in the song db invalidate an otherwise fine match), and 'Artist Whitelist' (song artist tags must contain at least one of these for lyrics to be retrieved). Read readme.txt for more details.